Room 13 is looking for an experienced artist to join our team to deliver part of Generation Creative, our project funded by the Big Lottery Young Start fund. The successful candidate will travel to, and work creatively with, local secondary schools to promote the work of Room 13 and encourage visits to our studio facilities. This summer, Room 13 Community studio offers a unique experience to individuals who are interested in the mix of creative and business based activity. This block of workshops will introduce you to working with a team of artists and entrepreneurs in a studio environment to focus on the process behind realising a creative idea. It will provide you with the opportunity to think and experiment with the design process and put into practice a working method that aims to take you from idea to finished product. This will inform your wider artistic practice and develop your business thinking. During the week’s workshops you will share the studio space with professional artists and business people who will help to develop your ideas, thinking, and as part of a team, create a brand to produce products to market at an event held in the Room 13 studios on the Saturday and throughout the local area. Room 13’s screenprinting summer school is open for applications. We are thrilled to have received an award from Big Lottery Young Start Fund in support of our new ‘Generation Creative’ project. The aim of ‘Generation Creative’ is to extend the benefits of participation in Room 13, and deliver our cornerstones of creativity, enterprise, arts and philosophy to greater numbers of young people in the Lochaber area, many of whom haven’t been able to access Room 13 previously. The £49,490.00 award from Big Lottery will ensure the fantastic new Room 13 studio facilities in Caol Joint Campus are used for the wider benefit of the community, with a key focus on developing young people’s creativity throughout the region. This project will enable our lead artist Richard Bracken to work with children and other contributing artists to develop a programme of delivery for primary and high school students, starting January 2017 and continuing throughout the academic year 2017/2018. In the course of this project, Room 13 will work with 10 primary schools in the Lochaber area to provide opportunities for children to work alongside professional artists and develop creative projects based on their own ideas and initiative. We will also develop and extend our youth volunteer group (aged 13-21) to involve students from the four local High Schools enabling them to develop their own ideas and projects, gain experience and build an understanding of the economic prospects of a career in the creative industries. Confident – children and young people have more confidence and skills. Enterprising – Young people are better prepared for getting a job or starting a business. A homage to John Cage prepared piano* by Lochaber High School S3 Music class; applying new and experimental ideas and methods to music, art and technology. 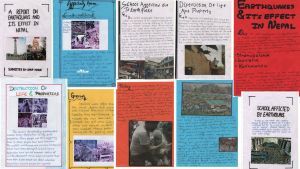 The film showcases the pupils’ pictures and film, sound from field and voice recordings; sculptural objects, drawings and interactive artwork*. Room 13 Artist in Residence Audrey O’Brien worked with the class to explore new and experimental ideas and methods to music, art and technology using new electronic touch board tool, which allows any surface to connect to the digital world by conductive material or electronic paint. Over four class periods in May/June 2016 Audrey worked with music teacher, Mr Young and 17 young people to learn and use and create their own ‘instruments’. Mr Young had previously taught the class about one of the major figures in the modernist movement in music, John Cage. The class studied Prepared Piano – in which Cage placed objects on piano strings to alter the sound when played. To reintroduce this method, Mr Young suggested the pupils experimented with objects on the school piano strings. The project started by collecting the objects pupils had in their school bags that were conductive, adding these to a collection of conductive objects on a table in the middle of the room. The most notable object to emerge from a school bag was a ruby shoe! The metal studs recorded on the piano generated unusual sounds. 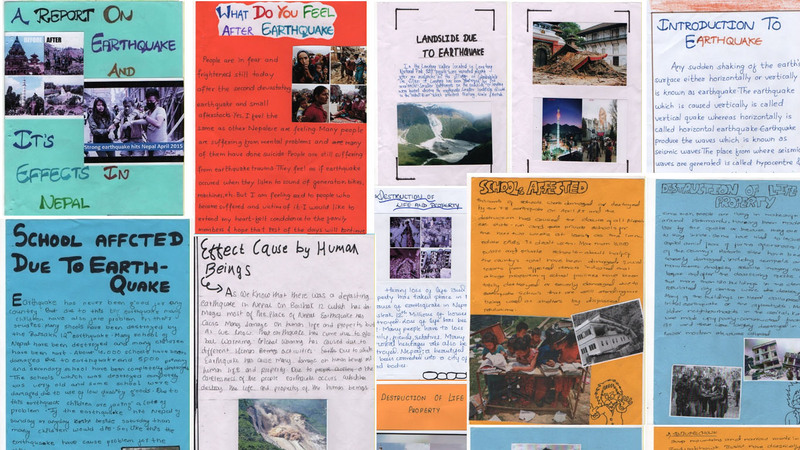 A series of field recordings were then made by pupils from their own environment. Sculptural objects were made by cutting and bending aluminium wire rods. These small sculptures would form the main body of their ‘instruments’ and the surface to connect to the digital recorded sounds via the Touch Board. The project culminated in a performance with pupils acting as both audience and participants as their handmade ‘instruments’ were played alongside an improvised musical score. Pupils photographed and filmed the entire process, which is shown here in this short documentary film. Audrey O Brien was appointed by Room 13 International to work with pupils and staff to develop and deliver a series of cross curricular projects and creative engagements at Lochaber High School. Audrey’s role, and the many projects she effected during her residency with Room 13, was made possible with project funding from Highland Youth Arts Hub and supported by Creative Scotland’s Time to Shine initiative. 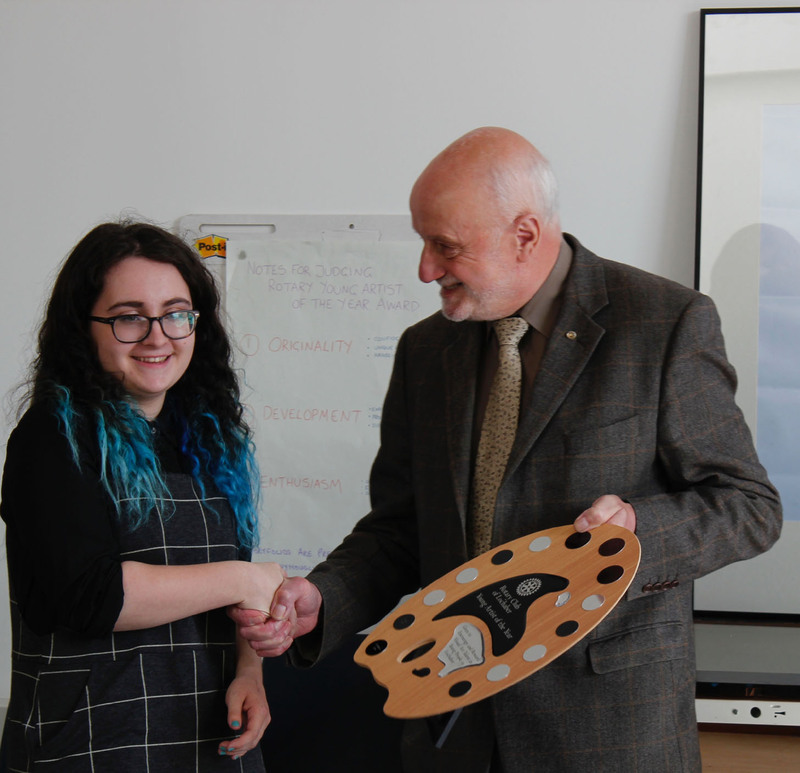 Congratulations to 17 year old Emma Cameron from Strontian, winner of The Rotary Club of Lochaber’s Young Artist of the Year Award, 2016. Emma won £100 voucher for ArtMedia store in Inverness. Runner up this year was 8 year old Matilda Van de Peer, also from Strontian, who won a £50 voucher. A further 3 young artists had their work Highly Commended. They were: Bethan White, from Ardnamurchan High Shool, Joanna Wood and Francesca Marie Rose from Lochaber High School. The prizes were awarded at a presentation and reception for the entrants and their parents hosted by Room 13 Community Studio on 25 May 2016. Rotary Young Artist of the Year Emma Cameron receives her prize. The young artists gather to receive their awards. The selection panel were delighted by the quality of the entries this year. 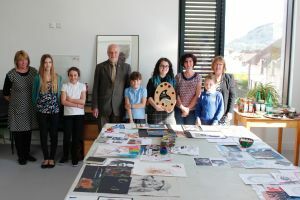 Portfolios were submitted from across Lochaber and the award winners were chosen by Lorna Finlayson from Art Lochaber, local artist Ali Berardelli, and Margaret Boyd, representing the Rotary Club of Lochaber. Both Emma and Matilda’s work will be on display at the Art Lochaber exhibition taking place at the Ben Nevis distillery between 20th May and 1st June. 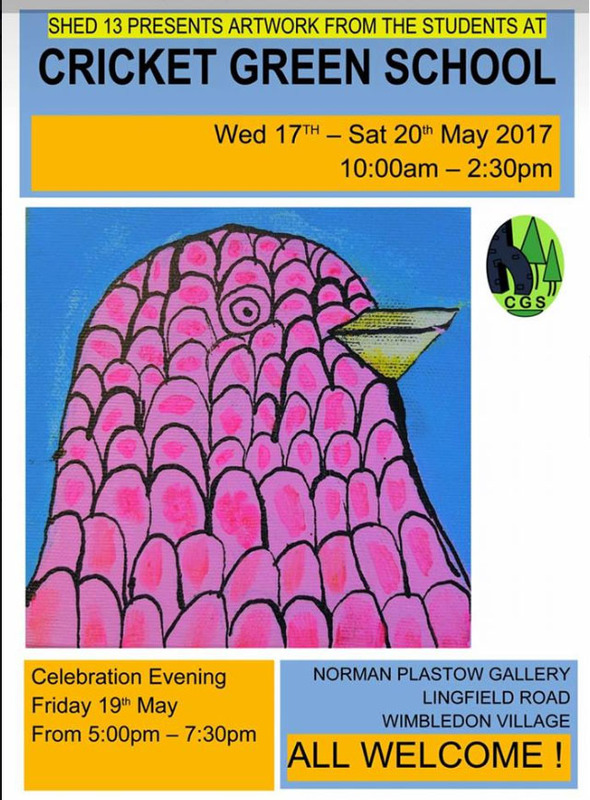 The exhibition showcases local artists working in oils, acrylics, watercolours, pastels, batik, wood turning, and papier-mache sculpture. Room 13 International have have been running the award on behalf of the Rotary Club of Lochaber for three years. The Rotary Young Artist of the Year Award is open to young artists aged between 7 and 17 living and working in Lochaber. The winners are selected for demonstrating originality, development and enthusiasm as artists. 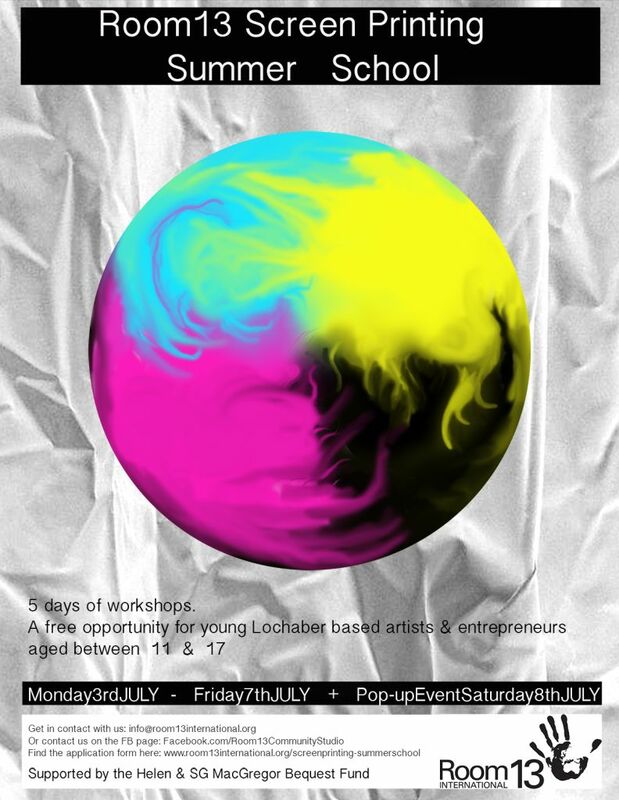 Young artists across Lochaber are encouraged to start thinking and preparing for next year’s award straight away! 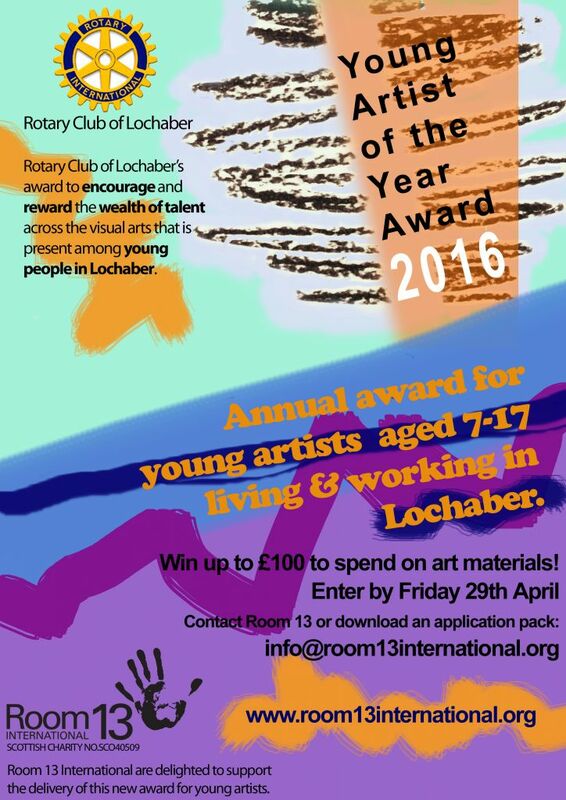 We are pleased to announce the launch of the Rotary Club of Lochaber’s Young Artist of the Year Award 2016. 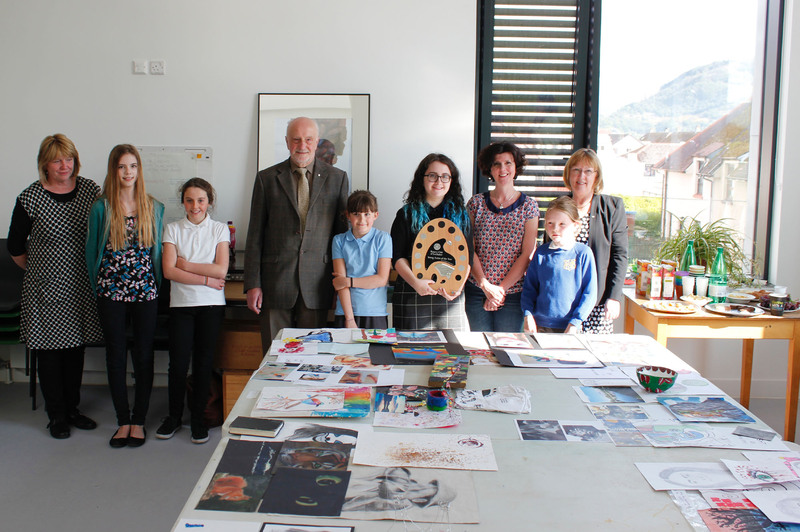 The aim of this award is to encourage and reward the wealth of visual arts talent present among young people in Lochaber. The award is open to young artists aged 7 – 17. There are no separate age categories. The Young Artist of the Year will be selected by a panel of judges viewing a small portfolio of work from each entrant. One overall winner will be named Young Artist of the Year,plus 2 runners-up and up to 4 Highly-Commended entrants. The selection panel will be looking for evidence of a commitment to making artwork and evidence of the young artist’s originality, development and enthusiasm as an artist, regardless of their age or level of skill. Awards will be made on the basis of overall achievement. Portfolios can contain visual work in any media, and may include photographs, films, sketchbooks and sculpture in addition to drawings, prints and paintings in traditional 2D medium. Our thanks to all applicants who submitted proposals in response to our brief for an artist to join our team in Lochaber. After much deliberation, with all candidates being of a very high standard, we are thrilled to announce that we have appointed Audrey O’Brien as a new Artist in Residence working with Room 13 in Lochaber. Audrey will focus on developing and delivering a new series of projects and creative engagements with community groups and local schools, particularly Lochaber High School. Audrey will work closely with Richard Bracken, who is currently the lead artist for Room 13 in Lochaber and the Room 13 International team. We are very excited about working with her too! She is very passionate about the project and we think she will bring a lot of experience and enthusiasm to the role. This new role will expand the team of artists working with Room 13 in Lochaber and creates new opportunities for us to promote engagement and understanding of contemporary arts practice among the community and reach out to groups already keen to work with Room 13. With Audrey on board, we will have greater capacity enthuse, involve and mentor a core of young people as collaborators in visual art projects in and out of school. This new residency opportunity has been created as part of our delivery as a partner in the Highland Youth Arts Hub and is supported by Creative Scotland’s Time to Shine Fund. Our thanks to the interview panel including HYAH representative and youth volunteer who gave up their time to help us in the selection process. These hand written reports by senior pupils from Pokhara region of Nepal are among the updates we have been sent recently on the work we have been supporting with your donations. 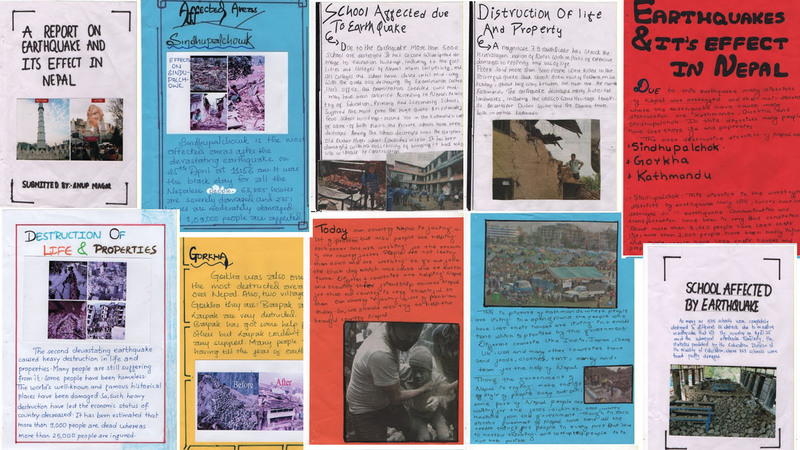 The students writing the reports have investigated the many issues affecting them and their country as a result of the earthquakes, including; Destruction of life and property, Affected areas, Heavy rain, flooding and landslides, How schools have been affected by the earthquakes. 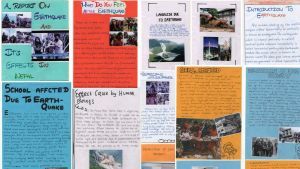 One student determines the effect caused by human beings as a result of global warming. Many expressed their own feelings about the earthquake it has affected them personally. It is extremely rare for pupils in Nepali schools to be given any opportunity for self expression – most learning is by rote. These thoroughly detailed yet creatively presented reports result from ORION Institute’s determination to inspire and educate young people through the medium of arts and creativity. Room 13 International is proud to be associated with their efforts! 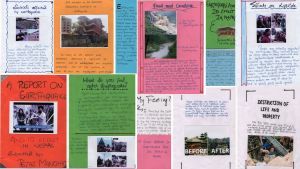 We hope to continue to support them as they work to set up Room 13 Art Training Center in Pokhara, Nepal. The relief effort to help communities in Nepal recover from the effects of the devastating earthquakes is ongoing. Room 13 International, Unit 1, Glenloy Street, Caol, Fort William, Scotland, PH33 7DR. Please make cheques payable to Room 13 International, and mark ‘Nepal Fund’ on the back. Thank you for supporting our global community.